Scouts of Serbia offer free meals: the impact goes far beyond the bowl of soup! 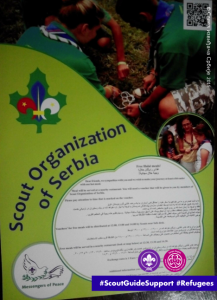 Scouts and Guides contributing to refugee support activities in their local communities in Europe (30): a story from Савез извиђача Србије / Savez izviđača Srbije (the Scouts of Serbia). The main goal of this project run by Савез извиђача Србије / Savez izviđača Srbije is to provide relief to the increasing number of refugees transiting through Serbia by providing them with meals prepared in accordance with their religious believes and to help them make their journey onward as safe as possible by passing on basic information which will make them less susceptible to fraud. The information about this activity is distributed widely through media and social media, which will improve the public’s perception of refugees and reduce possible risks of intercultural conflicts between them and the local population. The distribution of free meals and information sheets to refugees going through the area around the main bus station in Belgrade started on Monday, 19 October and has continued to this day: so far, we have distributed 4500 meals to refugees. The distribution is supported by groups of 7 to 9 Scouts from Serbia every day (and one day a Scout from the Challenger ESU in the UK helped out, too). While distributing meals, the volunteers are also using the time to talk to the refugees and give them information they need, as well as act as provide some emotional support to them so that they feel welcome. Information leaflets are distributed in English, Arabic and Farsi. And as we noticed that many leaflets are left behind, we have also create large bill boards with the same information which we have put up in and around the main bus station of Belgrade where most of the refugees are gathering. The project is supported by the Messengers of Peace initiative of the World Organization of the Scout Movement (WOSM) and the World Scout Foundation and received additional support from the Schüler Helfen Leben Foundation, allowing the Scouts to add tea to the offered meals. A catering company has donated fruit. The activity has been recognized by the city council of Belgrade and city officials paid a visit the other day, encouraging the Scouts and refugees. Seeing that this kind of activity has a positive impact on refugees, because they feel welcome, supported and rejuvenated we came to the conclusion that even though free Halal meals are main focus of our project, interaction and kind words of encouragement and support from our Scout volunteers are just as important. We would like to encourage YOU to try and help these people any way YOU can because they need all our attention and support. The change starts with YOU!